This 4 bedroom, modern style house plan measures 474m2. The modern design features in this house are unique and pleasing to the eye. The bold pillar at the main entrance is unique and contrasts the general flat roof forms by piercing above it. 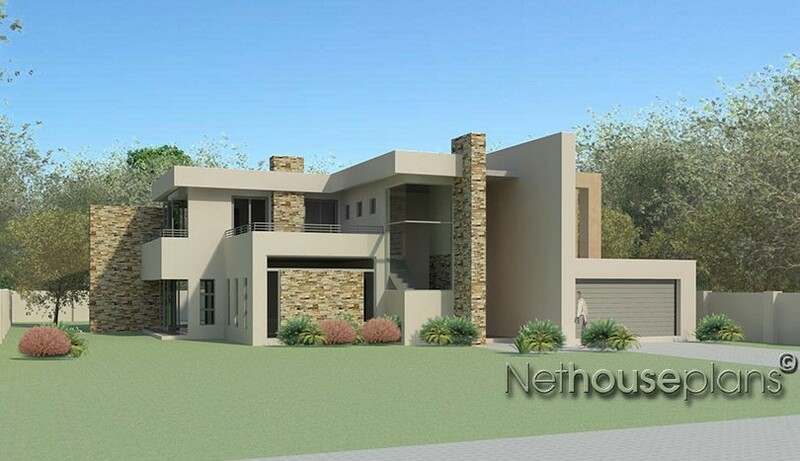 This 4 Bedroom comes with an open plan kitchen, dining, family rooms. The Kitchen, with it’s kitchen Island has an open view to the patio and the swimming pool areas. The garage opens onto the spacious entrance hall and therefore private if you have visitors elsewhere in the house. The staff room is located behind the garages and provides a separate access from the main house areas. The pantry and scullery areas have enough cupboards for all your groceries and storage. The lounge is located adjacent to the entrance hall with a private entrance that ensures seclusion for those private meetings. 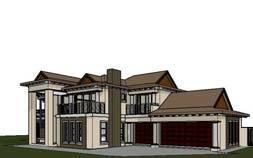 This 4 bedroom house plan has a guest bedroom en suit on the ground floor level. The flow of this floor plan make this house an entertainer’s delight. The staircase near the entrance provides easy access to the first floor level. 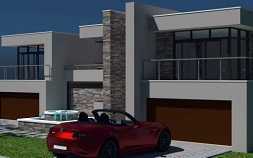 The First floor consists of 3 bedrooms that are self contained each with an en-suite bathroom. The Pyjama lounge is central to all 3 bedrooms and has easy access to the balcony. There is another large balcony adjacent the Pyjama lounge that has a street view. Access to all the bedrooms is private and ensures maximum tranquility to the bedroom areas. The master bedroom opens onto the balcony with a view of the swimming pool area. The master bathroom also opens onto a private balcony. First Floor: 3x Bedrooms (All en-suite, Master Bedroom with walk in closet), bathroom, pyjama lounge, fireplace, double volumes, balconies, linen cupboard.